Strawberry Cupcakes – Is It Springtime Yet? I have a sweet tooth, no doubt about that. But don’t worry mom, I do eat food categories other than “dessert”. When I say I love desserts, it’s not so much about eating desserts, as it is about appreciating that intersection of culinary science and art. So it’s probably no surprise that I love Extraordinary Desserts in San Diego and would go work with Karen Krasne in a heartbeat if I were to ever attend pastry school. She never fails to deliver art and beauty (and incredible flavor) in her creations. This Toutes Fraises (translation: all strawberries) from her cookbook is a sour cream cupcake containing freshly diced strawberries in the batter. The cake is filled with a strawberry jelly, and topped with a strawberry cream cheese frosting. 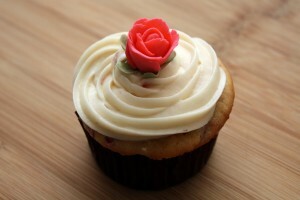 Extraordinary Desserts is known for decorating desserts with fresh flowers and petals. 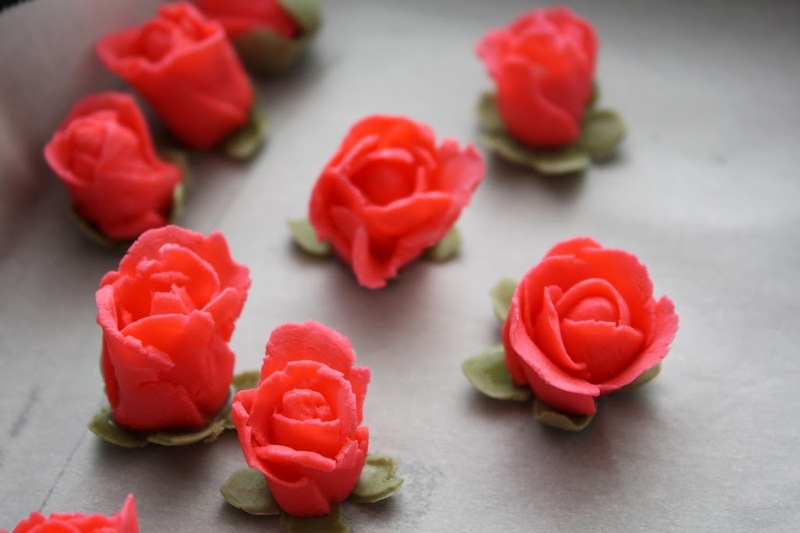 Here, I decided to work on my gum paste skills and came up with these gum paste rosebuds for decoration. Tedious, but very satisfying to make. I definitely eyed some flower bouquets at Safeway in case my efforts failed, but fortunately these were presentable enough (although a bit on the “toxic pink” side in color). I’d venture to say that the 250 degree oven setting may have been a typo in the recipe, as 350 is typical for cakes, and 250 definitely did not get the job done. The cupcake was yummy, but perhaps next time starting at 350 degrees or closer to 350 will avoid temperature adjustments and give me better control over the cake’s texture. Can’t wait to try more of my favorites from the cookbook! 1 Comment on Strawberry Cupcakes – Is It Springtime Yet? YUMMY. My bro liked it too — I had to share 😉 Thanks for sharing too!